If you have not created any Environments, there won't be any environments for you to start up. Maintaining a limited number of Environments will make it easier to set up and manage batch processing queues. For example, you can create four Environments, like test, commercials, and one Environment per features or series. 1. Open a command prompt or Terminal. 3. You must enter the machine name on which you want to set up batch processing. ‣ Type "all"  to create a default schedule for all machines in the machine-list or press [Enter] to create a schedule for only the machine you are currently using. 4. If you enter only one machine name, you must decide if you want to input more machines to process this Environment. ‣ Type "y" and press [Enter] if you want to enter more machines or press [Enter] if you don't want to enter any more machines. 5. Identify the type of work this machine will be doing, vectorizing, rendering or both. ‣ Type "y" if this machine will vectorize drawings. ‣ Type "y" if this machine will render scenes. ‣ Identify the environments this machine will process. ‣ Type the number (not the name) for each environment you want to set up on this machine and press [Enter]. A space (or a comma) must separate each environment number. 6. You can prioritize the Environments based on the order you entered them in the previous step. Typically, you will not want to prioritize environments like this. ‣ Type "n" and press [Enter] if you don't want to prioritize environments. ‣ Press [Enter] to turn the input on. 8. 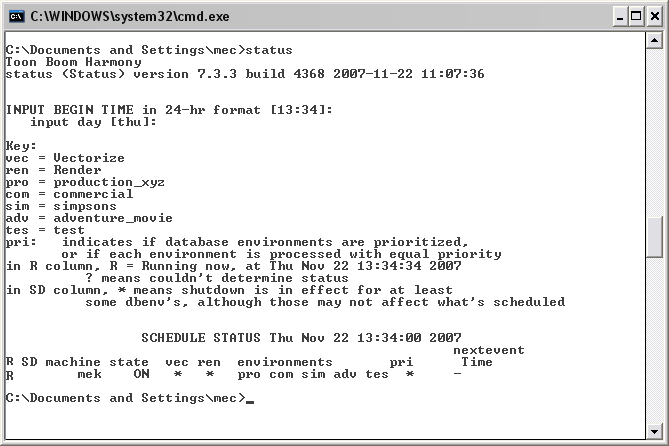 When you are done, a status message appears indicating that the machine is set up for batch processing using the default schedule. 9. Press [Enter] twice to get the report. The machines that are set up to batch process should appear in the report. There must be an "R" next to the machine name and the status must be "On" to be able to batch process.